Things got moved around a bit this week, so our movie post is, just for this week, a weekend feature. Last Friday was my favorite romantic drama – Wuthering Heights, a beautiful soulful film. So I thought it would fun, in honor of Valentine’s Day, to discuss a more light-hearted romantic comedy. 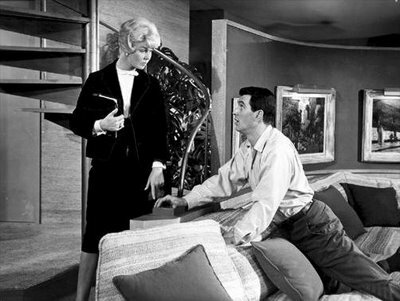 Pillow Talk is probably my favorite of the Rock Hudson/Doris Day/Tony Randall capers. 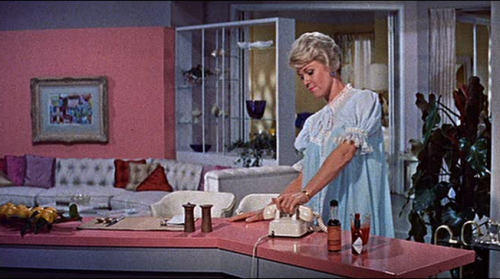 I really think Doris Day is a vastly underrated comedic actress. She is just so wonderful in this frothy feature that even my teenagers find this movie entertaining. 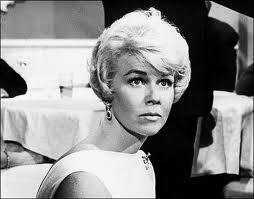 In fact, Doris Day was nominated for a best actress Oscar for this film. She didn’t win – that honor deservedly went to Simone Signoret for her incredible performance in Room at the Top. It did win, however, for Best Writing: Original Story and Screenplay – impressive (and perhaps rather surprising) when you consider its competition included such films as Truffaut’s semi-autobiographical 400 Blows and Ingmar Bergman’s Wild Strawberries. The concept is simple. 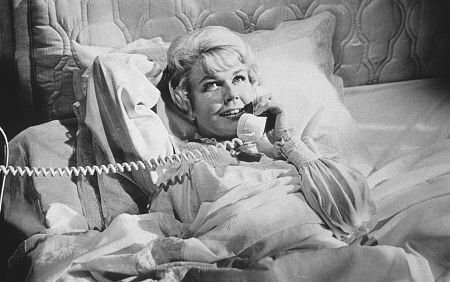 Doris Day (Jan Morrow) shares a phone line (in 1959 there were such things) with party boy songwriter Brad Allen (the very hunky Rock Hudson). 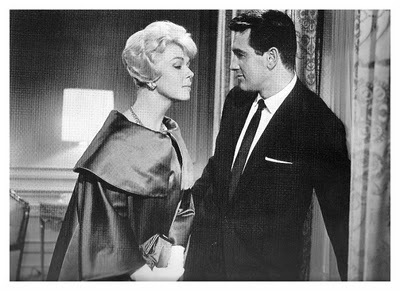 Miss Morrow, a successful interior decorator must listen to Mr. Allen’s endless womanizing of his long list of dalliances. His monopolizing of the phone line sends her into a tizzy and their animosity builds. Things take their inevitable comedic turn when Allen, through his producer Jonathan Forbes (an absolutely hysterical Tony Randall), learns that Morrow is actually quite the babe. Determined to make her his latest conquest, he takes on the fabricated identity of a visiting Texan tourist, Rex Stetson, to woo the attractive and seemingly virginal Miss Morrow. From there the fun begins. Day and Hudson have a fantastic on-screen chemistry. Somehow even the far fetched story line seems believable with their natural relationship. This was their first film together that led to not only other film pairings but a lifelong friendship. 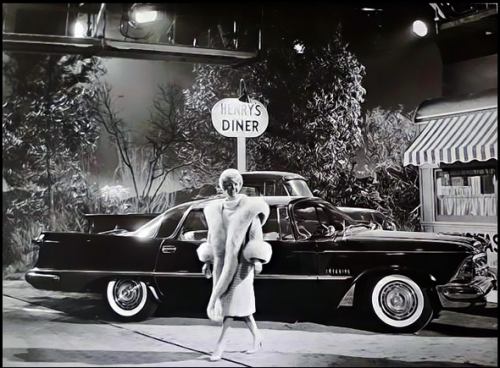 The film is also worth a look for the the iconic sets and costumes, fabulous odes to the era. 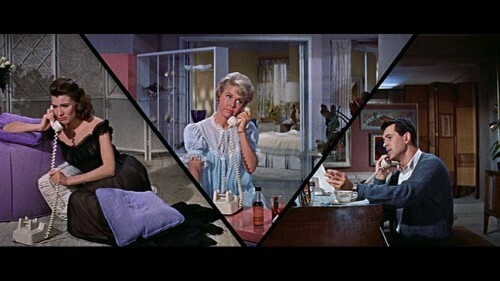 These split screen images were used quite a bit in the film to add a bit of suggestive appeal in a still demure way. Although they did let Day show a little leg. I wish I could have found more shots of her costumes – they are really wonderful. I just love this elegant coat – my mother had a fabulous navy satin dress with a color like this, which she made – among her many creative talents, she was an amazing seamstress. 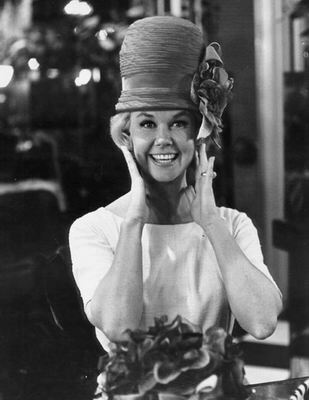 I love all these stylized hats, which went on to become important statements in 60’s fashion. 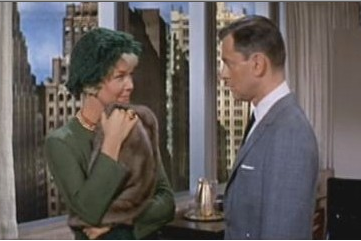 Remember Audrey Hepburn’s white cap I showed from How to Steal a Million? There are so many laugh out loud scenes in this movie. And one of the elements that makes this so successful is the incredible score and sound track. Each important look and realization is accompanied by a dramatic musical element. 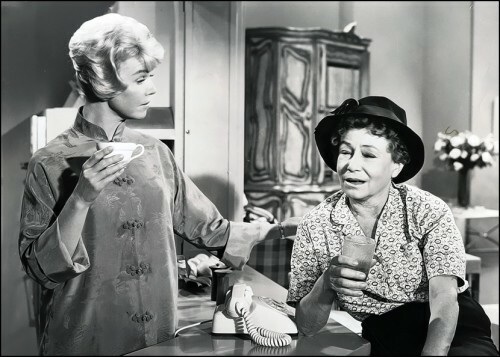 And I would of course be totally remiss if I didn’t mention the wonderful Thelma Ritter whose characteristic wise-cracking supporting role adds a whole other dimension. When you watch, be sure not to miss singer Perri﻿ Blackwell’s little dig in the Roly Poly scene. Here’s the trailer in all its vintage glory. Watch with someone you love!! This entry posted in film. 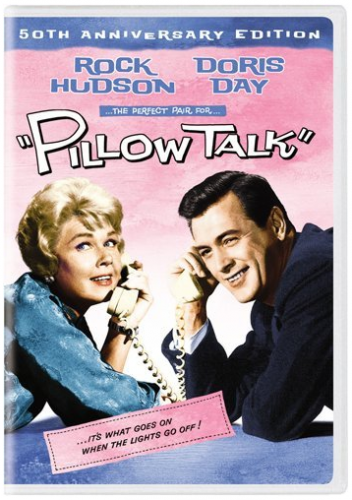 Entry Tags: Pillow Talk, Rock Hudson, Romantic Comedies, Romantic Films, Thelma Ritter, Tony Randall Bookmark the permalink. Ok I now have to rent this! Love great suggestions on old movies. They are the best! This is worth it just for the sets alone! My gosh, she has outlived everyone in Hollywood hasn’t she? Must be her love of animals. 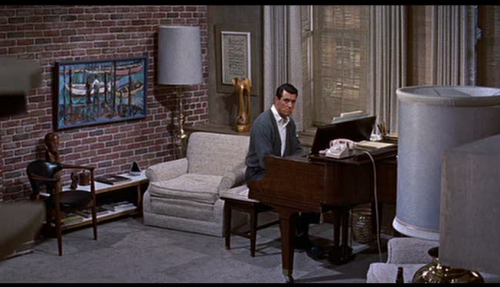 Love this film, the clothes, the sets, everything, just watching it puts you in a good mood. How to steal a million is currently running on TCM over here, I watched it for about the fortieth time the other day, I love Audrey’s black lace number with matching mask. I LOVE this movie! The sets are amazing, and her clothing style is brilliant. She’s even elegant when she’s casual. Love this movie! I can remember watching these many times as I was growing up. 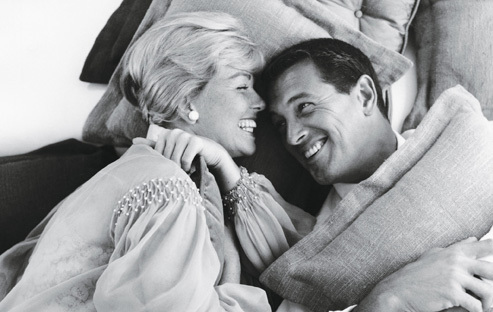 Who doesn’t love Rock Hudson and Doris Day? Absolutely loved this movie along with everything Doris and Rock were in. Thanks for the reminder of this great one. I so enjoy your posts! Love every bit of my vintage pieces from this era. I could certainly wear a hat for every day of the week. I wish hats would be in style! One of my all time favorites…and what a perfect choice for Valentines Day! 85 queries in 0.682 seconds.